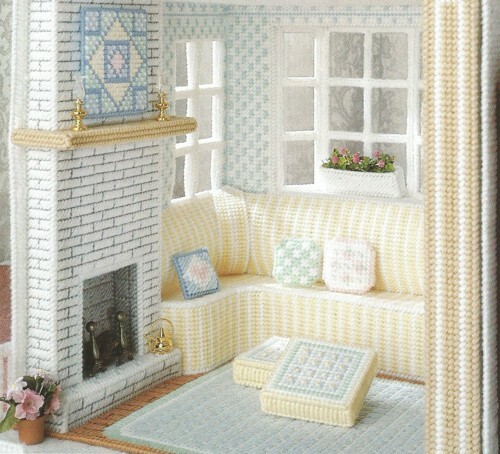 Dollhouse Fireplace. Feel the warmth of the fire .. March 2014 .. Create Warmth, Character and Ambience ..
A Dollhouse Fireplace sets the Stage ..
A dollhouse fireplace sets a great stage for all of the above. Warmth, character and ambience. If you are wanting to create rooms of this sort a fireplace can help. Especially when your aim is to make all you make as realistic as possible. The character and atmosphere of a place. "The relaxed ambience of the cocktail lounge is popular with guests." Synonyms:	atmosphere, air, aura, climate, mood, feel, feeling, character, quality, impression, flavor, look, tone ..
What dollhouse have you seen lately that truly captivated you? It probably was one that went the extra mile and made it look like you would love to live there. It was soooo life like. Right? Those are the ones I gravitate to as well. The ones that make you wish you were small just so you could curl up on the comfy couch and read a book. When designing look for ways you can make your own creations look just like home. Or if that's not the look you want try to create what you do want. This will help take your design work to the next level. It is sometimes hard work. But you really have to call on your imagination to succeed. Plus you always have your own living environment to help along the way. Do not forget that if what you have around does not inspire you. Then by all means step out of where you are and go to where you will be inspired. Pack your camera and take sufficient, discreet pictures of the surroundings. However if people do not mind you taking a photo of the lay of the land .. Then ask permission and go for it. Maybe they will be thrill. After all, some folk do like to be photographed. Your aim is to get as many detailed photos so you can study how everything looks. As you end your study you will then be ready to go in search of supplies to help in your creative quest. 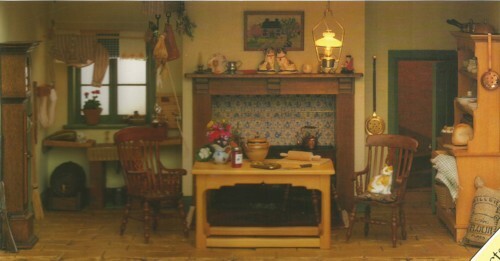 Next are three different pictures with dollhouse fireplaces. Or a variant. The plastic canvas example has a beautiful pattern for an entire living room setting. Venus and Martin Dodge's book Making Miniatures contains another full pattern. And finally the Pizzeria Pietro was illustrated in a recent Miniature Gazette Jan/Feb 2014 issue with no pattern (by N.A.M.E. not the issue in the link provided). 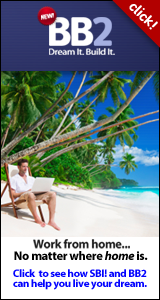 But clearly has some interesting ideas to help with your own design work. Click on any picture below to enlarge your view. Brick decorations on walls and fireplaces have been around for thousands of years. So any of these elements you plan on incorporating into your design will stand the test of time. We have all seen this kind of decor inside and out. Everywhere. All the time. Accordingly, these building materials will always be "in". To make your own fireplace of brick you will first need a pattern. And then to decide what materials to use to make it. You can use manufactured bricking, paper replicas, wallpaper type examples, brick facades of wood, or even purchase tiny 1:12 scale authentic bricks made of clay. 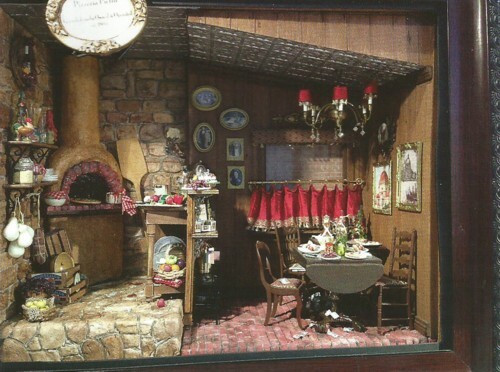 In the Encyclopedia of Dollhouse Decorating Techniques there are a variety of methods outlined to create brick work. From there you can develop your own method of applying it to your fireplace. 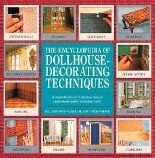 The above "part" steps are from the Encyclopedia of Dollhouse Decorating Techniques. If you want the complete method. You guessed it. You will have to obtain the book. I can only give you so much. As I never wrote it myself. 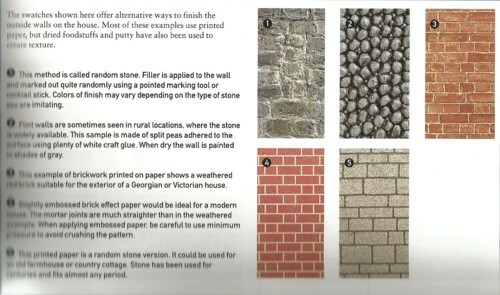 This volume does outline a couple different methods for making your own brickwork. As featured on the below part page illustration. All can successfully be used to finish, add style or life-like character to any fireplace you plan on adding. 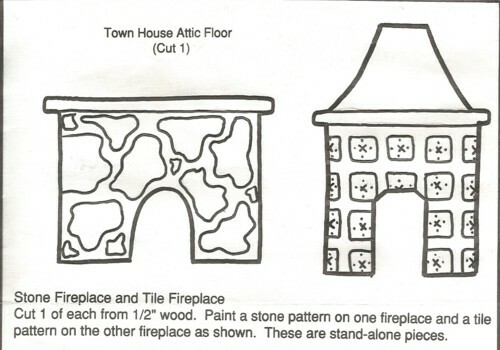 In the product box provided below you will find some of the materials you will need to complete your own dollhouse fireplace project. 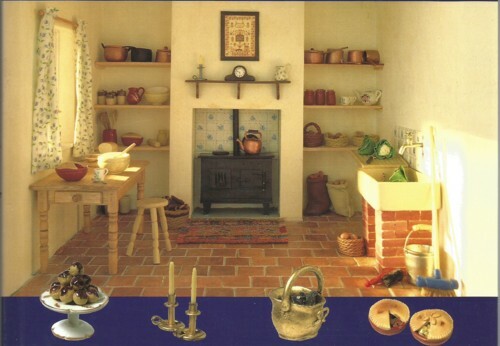 Illustrated from the Encyclopedia of Dollhouse Decorating Techniques. Also a number of the books spoke about are displayed below as well. Happy decorating. You will find as you add to your tiny dwelling your hobby will flesh out and become what you desire it to be.